The story of the “evacuation” doesn’t quite add up. Reports say shortly after 6 am, most of the 500 Afghan & Sudanese refugees who had been staying in the squalid encampment (lacking basic necessities like toilets, food, medical assistance) began boarding chartered buses to take them to “reception” or “accommodation” centers. Police said about 1,350, mostly refugees from other encampments, had gathered to be re-located to the centers. It isn’t explained what these reception centers are. They certainly aren’t for rendering hospitality (like showers & clean toilets or a hot meal) but are more likely for processing asylum applications. That would explain why so many came from far & wide to board the buses. Without explanation the story then proceeds to the evacuation by gendarmes which French authorities say passed off largely without incident. So a little elaboration here would be useful. 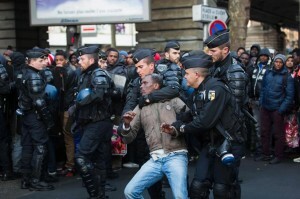 Did French authorities put out the word that they would be transporting people for processing asylum applications? Exactly how does their application process function? Can refugees just go down to the reception centers & apply or do they have to wait for the French government to haul them on buses? And why did French authorities combine that massive bussing operation with dismantling the encampment? That encampment of about 500 people was a testy place with frequent fights between refugees. Of course it was. Any human being who needs to poop or bathe or canoodle or chat with friends would find it a living hell to stay in such a place for an hour, let alone months of uncertainty. Pamela Gellar, the deranged, professional hater, Zionist, & Islamophobe, put a four-minute video on YouTube titled “Paris Muslim Mobs Violently Riot under Paris Metro.” It’s disturbing not because human beings under extreme deprivation & duress are acting out aggressively but because we can see the contemptible disregard for refugee rights & dignity by French authorities. And their louse of a president calls himself a socialist! It’s reported that 80,000 refugees applied for asylum in France last year. Applying isn’t the same as being given residence papers & work permits. That figure never gets reported. Immigration is a human right. Open the borders. 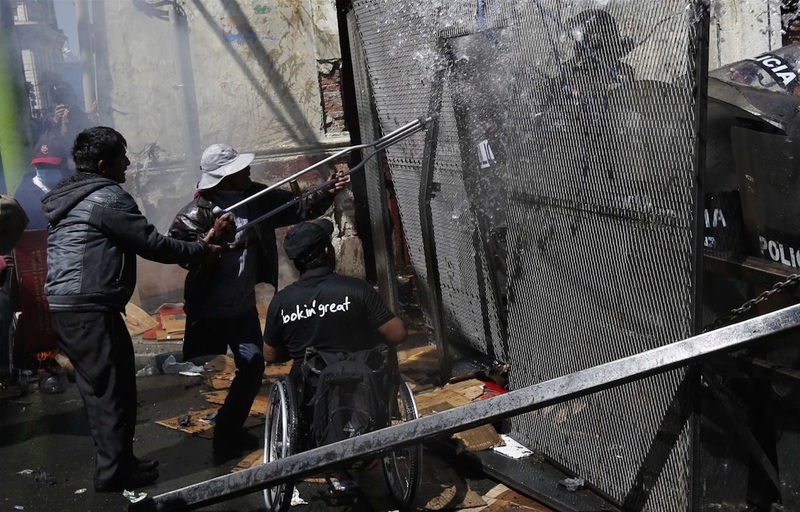 The disabled protesters who set out March 21st on crutches & in wheelchairs for a 234km/145 mi highway march to La Paz, the capital of Bolivia have arrived. They are demanding an increase in their state benefits from a paltry 1,000 boliviano (£102, $144) a year to 500 boliviano a month. In attempting to reach the National Palace where Bolivian president Evo Morales has his offices they were confronted with riot police blocking their way (shown in this photo), as happened the other times they made this protest trek. A good share of the left have completely lost their bearings in evaluating the regimes that took over from the military juntas of the 1970s. It probably isn’t a coincidence that these oligarchic regimes transitioned from juntas to their liberal facade at a time when neoliberal economics began to be implemented. That’s something that needs to be investigated. But it was likely intended to make the transition to outright plunder of natural resources by multinational enterprises less confrontational. Left analysts don’t see it that way. They crow about the dramatic reductions in poverty all over Latin America by regimes they consider left-wing & who they claim have rejected neoliberal economic policies. One research institute claims over 60 million people in Latin American have been lifted out of poverty by these beneficent regimes; according to the UN they have cut poverty almost in half in Latin America. Brazil under Dilma Rousseff is a showcase for them–which is why they denounce the protests against her neoliberal policies as rightwing. According to reports, Bolivia under Evo Morales, who became president in 2005, successfully reduced its dependence on the IMF & World Bank for bail out loans & with deft economic policies was charting an innovative & independent course–some kind of sui generis formation that could short circuit the inherent inequalities of capitalism–a capitalism but not capitalism. Maybe that kind of independence isn’t working out so well–more likely it’s completely phony–since last February Bolivia took a $200 million loan from the World Bank which it is still repaying for old loans. The new loan is for disaster & climate risk management & isn’t that admirable. But if they weren’t still paying back old World Bank loans, they’d have more than enough money to pay decent social security benefits to disabled workers. There is no evidence of poverty reduction in Latin America that means a damn thing. The overwhelming evidence is for increasing poverty, child labor, homelessness, slum growth; neoliberal economics that slash social services, education, health care & expropriate indigenous peoples for multinational mining & agribusiness enterprises. That includes in Bolivia & Brazil. Evil fairies from outer space bombing in Syria & good fairies in Latin America magically transforming the inherent inequalities of capitalism into utopia! Such is the regrettable state of political analysis coming from the left today. The Handwara minor girl & her family members today at 8 a.m again were prevented by the JK Police team led by Masroor Ahmad at Zachaldara while they were trying to leave for Srinagar. Still the Police & apologists of the State would want us to believe that the minor girl is under protection & not detention. If you were asked to characterize media reporting on the struggles of Palestinians against Israel & Kashmiris against India, it would be incoherence. From media reports, you cannot tell what in the Sam Hill is going on if you don’t spend some time studying other sources. People get so confused they begin to think the solutions to these conflicts are as intractable as the coverage in impenetrable. That’s the entire point of such reporting: to render things stupid. They’re not writing a book when they caption a photo but they shouldn’t try to pack so many confusions & irrelevancies into a few sentences. The caption to this photo read: “A Kashmiri-masked Muslim protester jumps in the air to avoid stones thrown at him by Indian police during a protest in Srinagar, Indian-controlled Kashmir, April 29, 2016. 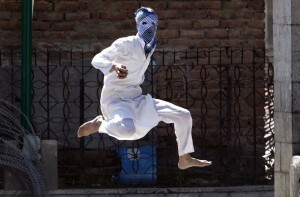 Government forces fired tear gas & pellet guns to stop rock-throwing Kashmiri youth after Friday prayers. The demonstrators were responding to a protest call by anti-India separatist leaders against what they said was government’s failure to arrest the troops involved in the recent killing of five civilians following an alleged molestation of a teenage girl student by an Indian soldier. That’s one way of putting things–if you have marbles for brains. But what’s this “Kashmiri mask” thing all about” Do Kashmiris have a special kind of gizmo they wear to protect themselves from tear gas assaults? Because it looks exactly like what protesters around the world wear. Why does the protester’s Muslim religion get cited? Has anyone ever claimed the conflict in Kashmir was rooted primarily in a religious conflict? If you actually want people to understand what is going on in this photo you might better caption it: This young man is one of thousands in Kashmir protesting the constant shootings of unarmed civilians by Indian occupying forces who are not prosecuted for human rights crimes. They are also protesting because a teenage girl who accused an Indian soldier of molestation is being held with her father & aunt in police custody against her will to terrorize her into silence. Indian troops are firing tear gas & pellet guns at the unarmed protesters. Pellet gun ammunition travels at velocities of 1,000 feet per second & causes permanent disfigurement, disability, & death. India out of Kashmir! Self-determination for Kashmiris!